Over the last day or two, I’ve been telling the conquests of Niketas Ooryphas, the terrifying Byzantine admiral who delivered the shocking attack on the menacing Cretan pirates in the Corinthian Gulf in the late 9th century AD. On Wednesday, I presented in a post the basic problem the portage event creates for the interpretation of the diolkos road: if Niketas really dragged his fleet, then it means the old portage road of Corinth was still in use 1500 years after its construction, or had been put back in use since antiquity. 2. One should also be somewhat skeptical about accounts that describe the overland movement of large ships as a simple matter. Our ancient sources consistently describe beaching or launching military ships in antiquity as difficult activities requiring tremendous effort. So much more difficult it was to move ships long distances overland! The standard Byzantine military vessel, the dromon (see image), was over 30 m long and 4 m wide and high, and weighed many tons. For some comparative modern perspective, these figures are about twice the length and width of an 18 wheeler tractor trailer truck. To haul an entire fleet of these ships over the isthmus in a single night would have been an incredible fleet. 3. 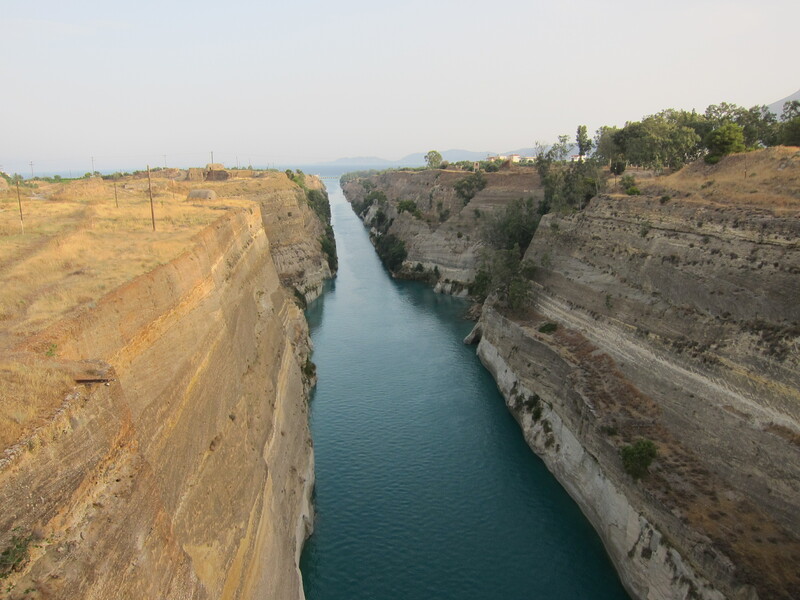 The Corinthian Isthmus seems narrow and flat from Acrocorinth, but spans 7,000 meters across and climbs steeply from sea level to an elevation of 85+ meters at the spine, creating a grade averaging over 2%, increasing the necessary required traction force for the portage significantly. The land bridge could only have created very real difficulties for moving large and heavy vessels. These accounts suggest that dragging a fleet was an incredibly involved affair that required minimally a hard road surface, the preparation of wheeled sleds or wagons for moving the vessels, and some time. The notion that Niketas Ooryphas transferred 100 ships in the darkness of a single night does seem most improbable. On Monday, I’ll deliver the final installment of the Niketas Ooryphas adventures and try to place him and his portage into a 10th century context.